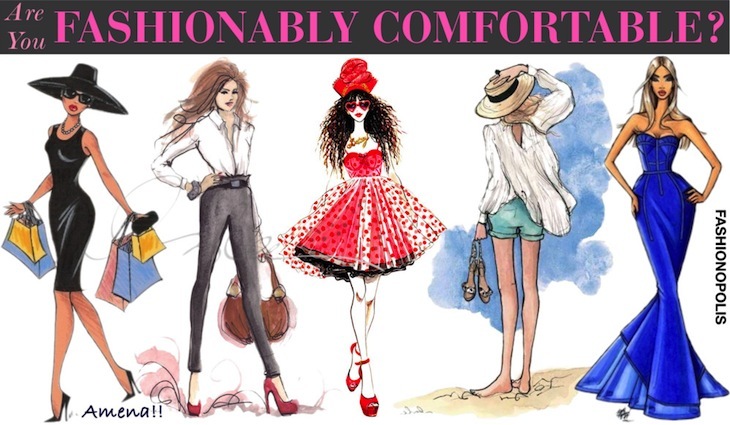 Fashion | Beauty | Body Positivity | Lifestyle | Pop Culture: Are You Fashionably Comfortable? Great post! I wear my tees with perfect fit and three quarter track pants.. I hate it when women wearing fitted clothes with bulging fat everywhere..
Can't agree more with your definition of confortable fashion. It has to hide the flaws and we are good to go ! Love the theme you picked up! I'll stick to my good old jeans and tees for work.. If I'm meeting a client or someone important, the jeans get upgraded to my jeggings or nicer tights and the tee becomes a tunic or a nicer blouse. But really, how does one stay comfortable and work as a stylist? Especially when the job requires you to run around, visit dodgy areas and other mad stuff?? i like to wear whatever i like. period. i don't care what others have to say about it. Despite, uncomfortably tight/ short dresses or impractical jeans, there is one line I never cross - heels (unless we're talking nights-out)! That's right! Ballet flats/ brogues for regular days. In the city of traffic, I need to keep my legs mobile! I always choose comfort over fashion, and that is why I can never fall in the category of being "fashion forward." Great post - I agree fashionable and comfortable should not be mutually exclusive, but sometimes we all have to pick one over the other! For me, as long as I have comfortable (yet good looking) shoes, I am OK with high maintenance outfit! That's ll the comfort I need:-)I usually carry foldable ballet flats in my bag, for this reason! Good luck with ur hunt!